The Bunnery Jackson WY is a cool, comfortable and casual place for a hearty meal or a delicious snack. It is located in the heart of Jackson, a town in the Jackson Hole Valley of Teton County, Wyoming, US. The bunnery in Jackson WY is the only local restaurant that is also a bakery. And so it is famous as The Bunnery Bakery & Restaurant. The Bunnery Natural Foods is also a part of the original Bunnery. 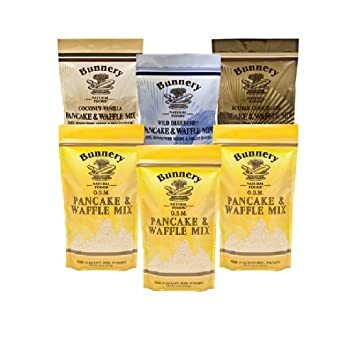 It sells Bunnery O.S.M pancakes waffle mixes, and more products online. The Bunnery Jackson Hole WY Bakery is well-known for the bread and specialty baked products prepared daily. Enjoy these foods at its best on their outdoor deck. They use only the freshest ingredients to deliver the most wholesome food possible. Their famous items include OSM bread, made with a healthy combination of whole wheat, rolled oats, sunflower seeds, and millet grain. Plus you get to eat the best pancakes and waffles. They offer breakfast and lunch year-round and dinner only in summers. You can prepare these foods’ mouth watering taste at the comfort of your home by just buying them from Bunnery Natural Foods website – http://www.bunnerynaturalfoods.com/. O.S.M. Oatmeal – Made with oats, cracked wheat, oat bran, wheat bran, millet and sunflower seeds, it’s the genuine breakfast to give a fortifying start to the day for Jackson Hole champions. Prepare with hot water or milk, and is a warming, healthy, delicious breakfast. To make it tastier add your favorite fruit and a dash of honey. O.S.M. Pancake and Waffle Mix – This is Jackson’s favorite breakfasts, with bursting nutty flavor and texture. It contains wheat flour, oats, cracked wheat, sunflower seeds, millet, and bran. This makes it tastier and nutritious than ordinary. Coconut-Vanilla Pancake & Waffle Mix – Coconut bursts its flavor when baked in a pancake or waffle, and vanilla spikes its exotic tropical flavor. Make this delicious mix with fresh fruit or fruit syrup. Wild Blueberry Pancake & Waffle Mix – It is a healthful, delicious satisfying blend containing America’s favorite berry in a nutrition-packed version of a breakfast classic. Double Chocolate Pancake & Waffle Mix – This mix uses Callebaut dark chocolate chips along with the nutty, toasty goodness of oats, sunflower seeds and millet blends plus a dusting of cocoa. Use them for breakfast or as dessert. It looks great in a scoop of ice cream. Original Granola – This favorite mix of many Jackson people makes a satisfying, healthy dish into yogurt, fresh fruit or warmed with dairy or soy milk. It contains oats, coconut, sunflower seeds, walnuts, and almonds, and sweetened with a touch of wildflower honey. It is great for snacking. Add it in milk and fruit for breakfast, or with a rich Greek yogurt for dessert, or straight out of the bag for an energy snack. Blueberry Granola – This is the first Bunnery fruit-enriched granola. This blend includes America’s favorite berry, a rich source of vitamin C, cancer-preventive antioxidants and beneficial anthocyanins rivaled by few other foods. Banana Honey-Nut Granola – This deliciously healthy blend has abundant fiber content with banana, a bit of extra honey and nuts. Cranberry-Nut Vanilla Granola – Cranberry is another nutritional Native American fruit and adding a little vanilla and nut makes it unique Bunnery granola. The Bunnery Natural Foods product has reasonable prices. You can buy O.S.M for under $6 and all other products for nearly $6.5. Please note the product net weight is 12 oz. / 340g. The Bunnery Jackson WY – Where To Buy? You can buy the bunnery products from their official website http://www.bunnerynaturalfoods.com/. Or alternatively look for them at Amazon. Amazon offers the variety sampler packs, large size bags (15/ 18 ounces) and a pack of 6 at an affordable rate. So compare prices and if you are willing to buy a variety of bunnery natural foods product then check Amazon. Bruce says it offers the very best waffle mixes. Hugh and his family love all of the Bunnery Granolas as well as the waffle mixes. Kathy had breakfast at the Bunnery in Jackson, Wyoming and loved their OSM pancakes. So she ordered their mix online and the OSM pancakes made from the mix were as good and delicious as those at the restaurant. Peter likes the blueberry mix and says it’s great. It contains only 4g of sugar per serving, which is far lesser than most other granolas. It has real blueberries inside and his kids love this blueberry mix with yogurt. Erika loves O.S.M. oatmeal. It is a delicious and healthy alternative for breakfast. She loves it with berries and some of Bunnery granola to give it a crunch. BAM is not happy with his blueberry flavor granola. He didn’t like the strong clove flavor in this granola. New Yorker tried Double Chocolate flavor and says it is a good pancake mix with healthy grains and all but it does not taste like chocolate at all. One who visits the Bunnery Bakery Jackson Wyoming will never forget its fresh, healthy and delicious breakfast. To have their unique dishes tasted at home, order Bunnery Natural Foods Granolas, O.S.M. and other Pancake & Waffle Mixes, today.